Who is responsible for making a child under 15 years old (0-14) use a safety belt or a safety seat in a vehicle? Who is responsible for making a child under 15 years old (0-14) use a safety belt or a safety seat in a vehicle? Correct. Passengers 15 years of age and over are responsible for putting seatbelts on themselves. Who is responsible for seat belt use? The driver is responsible for ensuring all passengers under 15 years of age (i.e. 0-14) wear seatbelts or are in an approved child seat. Passengers 15 years of age and over are responsible for putting seatbelts on themselves. If you are riding a motorbike, moped or ATV, and some agricultural vehicles then you won't have seatbelts - this only applies to light and heavy vehicles. 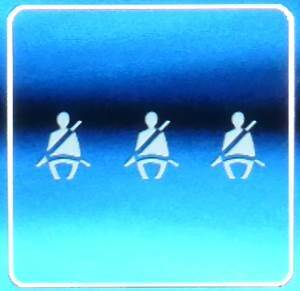 All passengers travelling in a vehicle where seatbelts are fitted in their seating position must use the seatbelts. There are special provisions for passengers aged 0-7 who must use an approved safety seat - you can read more about the requirements here. Your seatbelts must be kept in good condition or your vehicle could be ordered off the road in a roadside inspection, or it might fail its Warrant of Fitness. Most new cars will have a seatbelt monitor with audible warning for front seat occupants, and a monitor with a system of lights for rear seat passengers like this in a Peugeot 308 HDi for all five seats. Or this in a Holden for the rear seats only.